Built in 1979 at a shipyard in the then German Democratic Republic, this containership started life as the USSR-owned NIKOLAY GOLOVANOV (17,304 tons gross). There was a big shake-up within the USSR-owned fleets after the communist regime fell in 1991, and by the mid-1990s a very large number of ships had been sold or flagged-out. The NIKOLAY was sold to Westlex Shipping Co Ltd, of Cyprus, a subsidiary of Uniship (Hellas) Shipping & Trading, of Athens, Greece, and was operated by another subsidiary, Delphic Shipping Co Ltd. The vessel, which had a container capacity of 712teu, was on the charter market and retained its “Russian” connection with charter to Morline, for which it was renamed MOR CANADA. In August 1999, it became ZIM LIVERPOOL on charter to Zim Israel Lines. One year later it changed again to become CITY OF LIVERPOOL, but in 2003 was sold to MSC Mediterranean Shipping, becoming MSC PROVENCE. 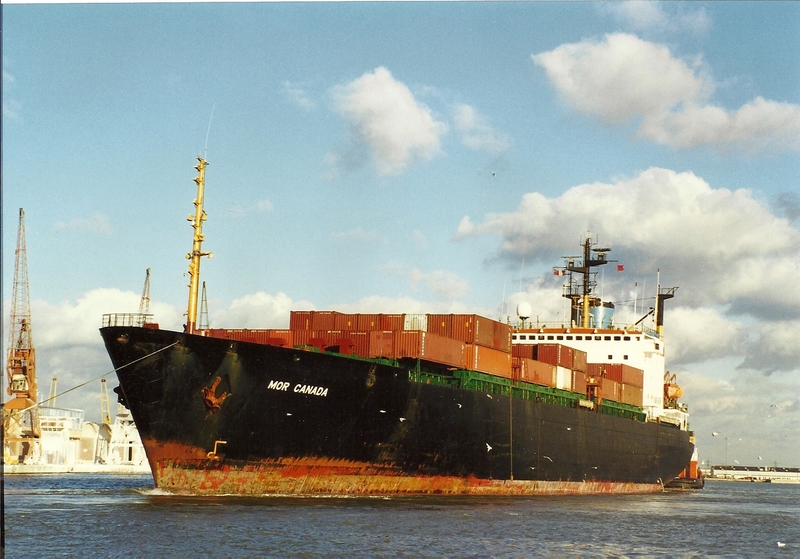 The vessel was broken up in 2010 at Alang, India, after a further name change in 2004 to MSC ERMINIA. See also Jack’s photo of MOR EUROPE.